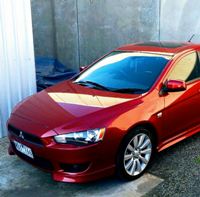 As my previous car was written off .i m about to buy the Lancer GSR My14.5 version. There's a few scratch here and there but doesn't bother me as it's already 3 years old. The only problem is "the passenger side headlight plastic is cracked inside and making it foggy I have no idea how it happened. I asked the owner and he said he never change the light bulbs. Would it be a problem ? will I need to replace the whole headlight or can i go to the dealer to replace it ? as it's still under warranty for another 2 years. Welcome and hope the buy goes well! 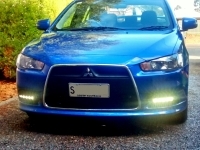 I got a feeling mitsubishi will not pay up for the fix as outer body cracks, slits and chips are generally wear and tear use, so if the fogginess is being caused by the cracked headlight they’ll ask to pay up! That’s just what I think though, not sure if the outer shell can be replaced, if so I don’t see it to be a big problem then! 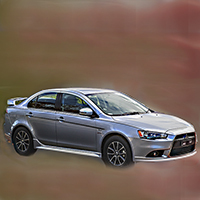 I would be checking about the warranty as i discovered the warranty on the lancer isn't trasferable to a secod owner. Seems silly as you can do it with most motorcycles but mitsubishi doesn't. bumblebee wrote: I would be checking about the warranty as i discovered the warranty on the lancer isn't trasferable to a secod owner. I think you will find factory warranty extends to new owner. However, extended warranty generally doesn't. It's too late to ask the owner to change the headlights before the final payment? it's all basic not even include the floor mats. sarusa wrote: I think you will find factory warranty extends to new owner. However, extended warranty generally doesn't. Correct, at least for our Mirage. Confirmed by dealer in writing the 5 year warranty, road side assist and capped service prices all came to us as second owner. If you are buying the car with a road worthy certificate, then the light should be fixed by the seller as this I believe would void the roadworthy certificate. Beware!!! According to Mitsubishi, I was told, warranty started when car was purchased by dealer and not from when you purchased new and registered it. In my case this was 4 months. Had a tough and persistent time getting them to bringing it forward to when I had it registered. They claimed warranty from first registered. Was when dealer took possession of the vehicle. would be an impossibility, as even if the dealer purchased the car for your order it would take anything up to a week or more before it was registered in your name, there fore making the 5year warranty to the purchaser an impossibility! False Advertising? As even a day less makes it less then the 5 years offered. Hello everyone, thanks for the reply. The cars come with RWC. i have no idea how he passed the RWC with foggy headlights or it happens after RWC ?. probably the fog is not in the main light rather it's on signal side. I saw the Paperworks of car and it stated the warranty started October of 2014. So i guess it's still under warranty as GSR version comes with 5 years warranty. What is the registration date,month? Is that also October? sarusa wrote: Beware!!! According to Mitsubishi, I was told, warranty started when car was purchased by dealer and not from when you purchased new and registered it. In my case this was 4 months. Had a tough and persistent time getting them to bringing it forward to when I had it registered. This is an old trick dealers use, same thing happened with my parents (Volkswagen). 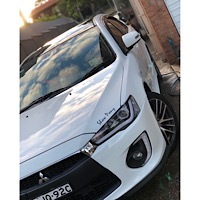 The dealer 'buys' the car from Mitsubishi Australia (MMA) and leaves it on their lot. As the car was bought the warranty according to MMA has started (MMA and dealer wear the same badge but are not same company). They do this so their sales targets for a given time frame are better as MMA see it then what they actually were. This means MMA gives them better incentives or rewards. A conscientious dealer should take the burden of the warranty, but as seen is not always the case. If that is true it would need to be mentioned on the warranty, which it isn't. If true it would play hell with comparable trade in price within the time frame of the warranty and I wouldn't have bought my lancer. triplenetz wrote: Hello everyone, thanks for the reply. The cars come with RWC. i have no idea how he passed the RWC with foggy headlights or it happens after RWC ?. probably the fog is not in the main light rather it's on signal side. I saw the Paperworks of car and it stated the warranty started October of 2014. So i guess it's still under warranty as GSR version comes with 5 years warranty. My understanding is if a RWC is older than 30 days then the sale isn't legit, most people will get an RWC after an intention to purchase or deposit is received, as was the case with my car, I gave the guy $500 as a deposit, he got the RWC and I picked the car up a week later (dude was a Police Officer, so I figured there was a degree of trust there) also writing a short 'contract' stating the deposit is refundable pending RWC is good so that you know they have done the work.